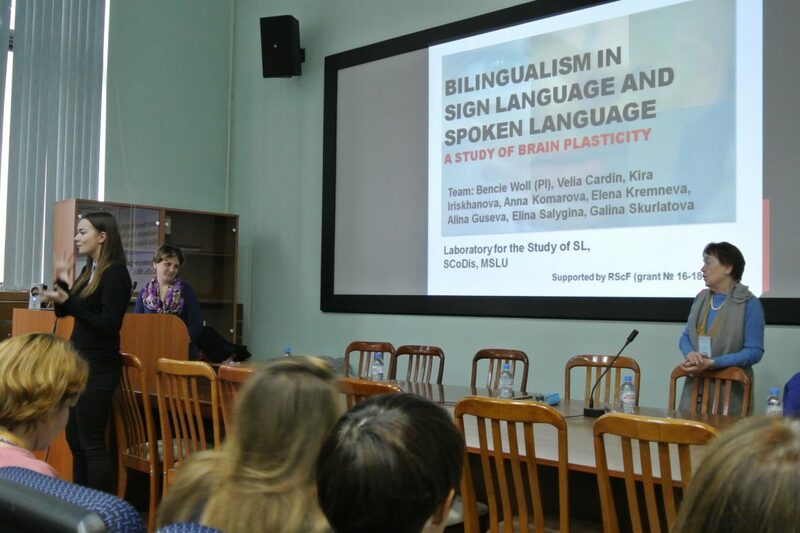 The international symposium “Bilingualism in Sign Language and Spoken Language: a Study of Brain Plasticity” funded by Russian Science Foundation (grant № 16-18-00070) was held at MSLU on October the 9th, 2017 and brought together an international team of experts working in such fields as linguistics, psychology and neurophysiology. Leading European and Russian researchers professor Bencie Woll (Great Britain), Dr. Velia Cardin (Great Britain), professor Kira Iriskhanova (Russia), Anna Komarova (Russia) gave talks in front of a diverse audience of colleagues, students and guests. The project team members Elena Kremneva (Neurology Science Centre), Galina Skurlatova (MSLU), Alina Guseva (MSLU) made presentations on various project related topics. Two additional experiments were carried out – “Designing studies with deaf and hearing participants: theory and case studies” and “Ethics, techniques and analyses: a practical session with case studies”, with the participation of project research team, MSLU students, deaf and hearing guests.